President Obama will nominate Janet Yellen to serve as the next chair of the Federal Reserve, a senior White House official said Tuesday. The announcement will be made on Wednesday at 3:00 p.m., the official said. 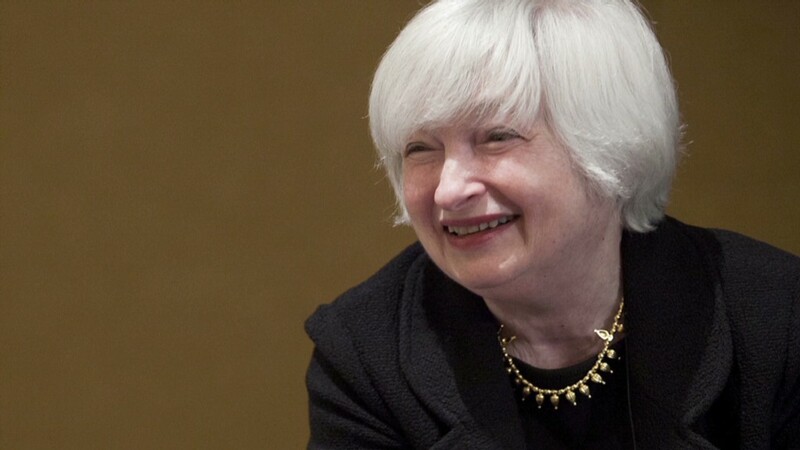 If Yellen is confirmed by the Senate, she will be the first woman to head the central bank in its 100-year history. Yellen got the nod based on a robust résumé, including more than a decade in various Federal Reserve roles. She currently serves as Fed vice chair and has pushed for the central bank to stimulate the economy to address high U.S. unemployment. Her views are considered to be closely aligned with current Chairman Ben Bernanke, and for that reason, the leadership transition is expected to be smooth once his term ends in January. Prior to her current role, Yellen served as president of the San Francisco Fed, and transcripts show that during that time, she foresaw the housing crisis better than many of her colleagues. In the late 1990s, Yellen served as chair of President Clinton's Council of Economic Advisors. She has also taught economics at the University of California, Berkeley and the London School of Economics. She has her bachelor's degree from Brown University and her Ph.D. in Economics from Yale. The chair of the Federal Reserve is arguably one of the most powerful jobs in the world, and this nomination comes at a critical moment. The central bank is considering reducing its current bond-buying program, and further down the road, the new Fed chair will also have to grapple with the complicated task of unwinding five years of monetary stimulus. Since late 2008, the Fed has accumulated more than $3 trillion in Treasuries and mortgage-backed securities, in its bid to support the U.S. economy. Yellen already knows the ins and outs of those policies, given she was on the team that implemented them. The confirmation process could take months, but Yellen already has key Senate Democrats on her side. 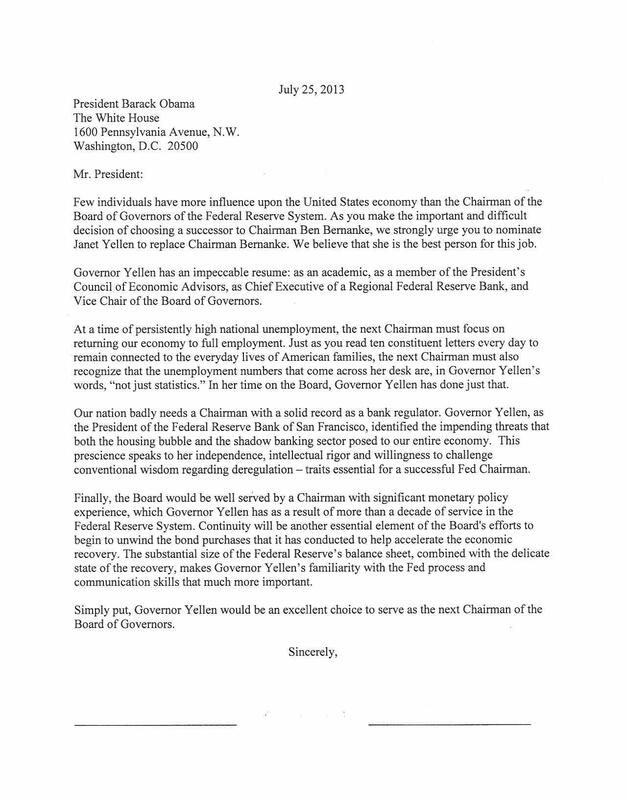 In the summer, when it seemed likely that President Obama was ready to nominate former Treasury Secretary Larry Summers to the job, Democrats wrote a letter urging the president to choose Yellen instead. In that letter, they praised her "impeccable resume," focus on unemployment and her "solid record as a bank regulator." Summers pulled his name from consideration, writing that he "reluctantly concluded" the confirmation process would be "acrimonious and not serve the interests of the Federal Reserve, the Administration, or ultimately, the interests of the nation's ongoing economic recovery." "She's an excellent choice and I believe she'll be confirmed by a wide margin," said New York Senator Charles Schumer on Tuesday night. "I commend President Obama on his selection of Dr. Yellen to be the first woman to serve as Federal Reserve Chairman," said Senate Banking Committee Chairman Tim Johnson. "She has a depth of experience that is second to none, and I have no doubt she will be an excellent Federal Reserve Chairman." Female economists: Pick Janet, but leave gender out of it! Economists -- and female economists in particular -- were largely supportive of Yellen over Summers. Many emphasized that her accomplishments alone made her the best candidate for the job, not her gender. "At the highest levels of central banking, there are very few women," Yellen said earlier this year. "But I am pleased that the representation of women is increasing a lot at other levels... I really think this is something that's going to increase over time, and it's time for that to happen." CNN' Senior White House Correspondent, Jim Acosta, contributed to this report.